Looking to expand your business into precision engraving or high-end finishes in plastic or metal fabrication? Or perhaps you’re ready to upgrade your entry level CNC router for one that offers a higher performance and higher productivity solution, but at a realistic price? Whatever your preference, the AXYZ Pacer is a serious contender. Built on a single-piece, heavy-duty steel frame, Pacer routers are designed to provide superior high-speed performance and ease of use while delivering precision, smooth cutting and quiet operation. 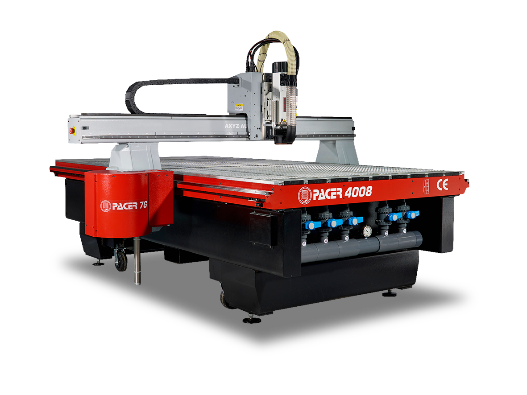 The Pacer is a router machine that easily outshines the competition for business owners in high production and industrial environments. The Pacer has built a solid reputation on its ability to cut high quality edges on a variety of materials. One of the reasons for this being the way it’s constructed and the materials it’s made out of. The base is solid steel, making it one of the heaviest, most robust routers in the industry. It also comes in four different sizes, from widths ranging from 60” (1524mm), 72” (1828mm), 85” (2159mm) and 103” (2616mm) and lengths from 48” (1219mm) to 120” (3048mm), making it easy to adapt to a variety of production requirements and popular sheet formats. The helical rack and pinion drive system with direct-drive servomotors and ball screw control on the Z-axis gives it a smoother, backlash-free motion which results in lower vibration and reduction in sound. It’s also easy to use, thanks to the AXYZ SMARTConsole and can be easily supplemented with additional options, including a 7 or 21 station automatic tool change system, twin or triple cutting heads, the latest AXYZ AVS Camera Registration System and a misting unit. Here’s a story from a customer that was so happy with his AXYZ Pacer router machine, that he bought not one, but two Pacers and hasn’t looked back since! The helical rack helps make the Pacer a robust, high performance and quality machine. What do you do when your CNC router no longer meets your needs anymore? You shop around for a new router and ultimately, choose the Pacer CNC Router from AXYZ. And when your business grows in leaps and bounds, you buy another one, so that you can meet the demands of several customers at a time. For Indianapolis-based Cardinal Manufacturing, this decision was probably the best one they ever made. Because of the Pacer, work flow improved, business expanded and they become the only sign company invited to display its products at a prestigious international annual conference and expo. “This router’s enabling us to do that. If you’re going to get a machine, get the Pacer,” says Jim Mulligan, Vice President and General Manager of Cardinal Manufacturing. The addition of a second Pacer provides the Indianapolis- based company the highest combination of quality and precision for all materials and applications. Watch an overview of the Pacer’s features here, or how it cuts Trespa in this clip. For questions about the Pacer, contact a member of your local Customer Care Team or fill out our online contact form. For Pacer’s accessories and options, visit CNCshop.com and check out our latest promotion.